A Fond du Lac County woman is accused of using a large number of tomatoes to hit her husband in the face as the two fought. Cash bail of $5,000 is set for 48-year-old Katherine Kranz. She was charged yesterday with first-degree reckless endangerment, disorderly conduct and misdemeanor battery, all with domestic abuse enhancers. A criminal complaint says sheriff’s officers went to the home in the town of Calumet August 17th after 46-year-old Russell Kranz went to a neighbor who called authorities. Kranz was bleeding from the head and told investigators his wife had hit him repeatedly, possibly stabbed him and struck him in the face with the tomatoes. 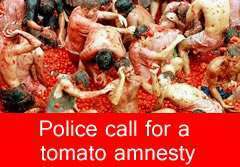 Officers reported tomatoes were crushed throughout the residence.